I am certain that everybody has experienced painful cramps from time to time. Cramps might happen when you are in the middle of a run or a swim or even when you are feeling comfortable at home and are in the process of falling asleep. Cramps commonly occur in the calves and feet and the resulting pain when your muscles tighten and harden can be excruciating. These painful cramps are the result of involuntary muscle contractions known as spasms that can occur in many of the body’s muscle groups besides the lower leg. One of the worst types of leg cramp is known as a Charley horse and causes a cramp so painful in your calf muscles that you may well scream out in pain. I have woken up on numerous occasions with a Charley horse and my poor wife has been called into action to raise my leg until the pain subsides. Fortunately, most cramps and spasms are not serious and are very short-lived. However, it is good to know that there are plenty of natural ways to prevent them happening in the first place and for treating any cramps you may have. What are cramps and muscle spasms? Before we go on to look at the best essential oils to treat them, let me explain exactly what a muscle spasm is. Muscle spasms are involuntary contractions in one or more of the body’s muscles. When you experience a spasm in your back, leg or neck, the muscles tighten and cramp up without you moving them yourself. Because the muscles can’t relax, they can stay cramped up for some time. Muscle spasms can actually occur anywhere in the body but are most common in the legs, feet and lower back. We have already mentioned charley horse that affects the calf muscles and other common cramps include menstrual cramp, lower back spasms and abdomen cramps from diarrhea. Other spasms can occur following exercise or just after getting out of bed. As we get older, we are more likely to experience more frequent muscle spasms. Unfortunately, our bodies lose more muscle mass every year as part of the aging process meaning more pressure is put on the muscles in order to support body weight. However, you can experience cramps and muscle spasms at any stage of life and nearly everybody will experience them from time to time. 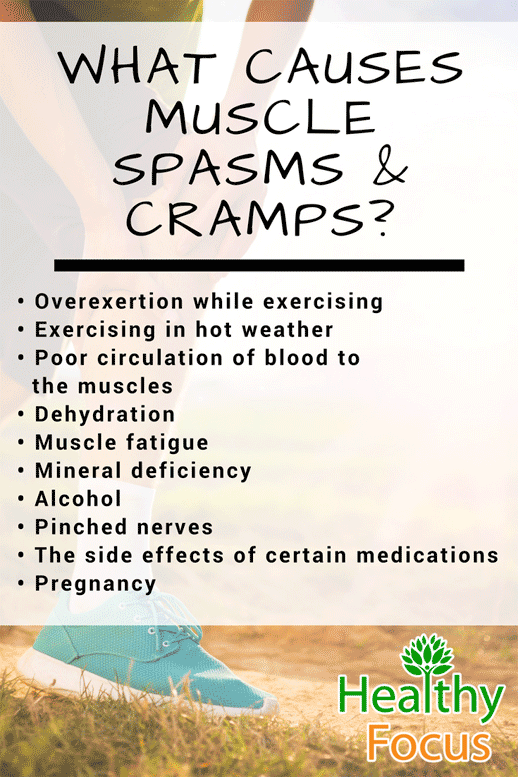 What causes muscle spasms and cramps? Muscle spasms generally happen with no advanced warning but there are a variety of reasons why they might occur and some people are especially prone. Stretching exercises can help reduce the incidence of spasms as can warming up well before exercise and making sure that you warm down properly. Dehydration is one of the main causes of cramping and spasms in the muscles. To avoid becoming dehydrated, you should drink plenty of water throughout each day. The recommended amount is eight ounces drunk eight times each day but you may need more if you are physically active or a larger person. When the weather is very hot or if you are sweating a lot through exercise or if you have been drinking alcohol, you will need to drink more water to stay properly hydrated. Bathing in Epsom salt is also considered to be an effective remedy. You should also make sure that your electrolytes are well-balanced. You will not be surprised to hear that various essential oils can also help with your muscle cramps and spasms. Many essential oils have the ability to soothe muscular aches and pains and treat cramps and spasms. It is probably one of the most popular and well used essential oils and for good reason. Lavender essential oil is full of therapeutic goodness that can be applied to an extremely broad spectrum of medical complaints both physical and mental. It is also one of the more gentle essential oils making it popular for those with sensitive skin. Lavender essential oil has a long history of use in successfully treating muscular pains and aches and is an effective remedy for spasms and cramps. Lavender oil is indicated for muscular spasms, cramps, sprains, and rheumatism making it an important if not an essential addition to your home treatment cabinet. Spasms may sometimes be brought on by stress as well as physical reasons and lavender is a well-known emotional tonic able to ease stresses and anxiety. If you can only afford one essential oil, lavender is certainly worth considering. Marjoram essential oil is another effective oil that can be used to treat spasms whatever their cause. Marjoram has powerful antispasmodic properties which not only ease muscle spasms but can relieve uncomfortable respiratory and intestinal spasms. As well as treating involuntary spasms and muscular pain, it can be used effectively for rheumatism, arthritis and migraine pain. Marjoram is sometimes referred to as the ‘happiness herb’ and you will certainly be feeling happier after using it. Thyme essential oil is a very powerful oil with a host of medicinal applications. While Thyme is known as a digestive and respiratory aid, it can also be massaged into the body in order to relieve muscular pains, spasms, cramps, gout, and rheumatism. Because of its potency, you must be very careful to dilute it properly before applying it to the skin and pregnant or nursing women should avoid it completely. Wintergreen essential oil is derived from the wintergreen plant and is one of the very few natural sources of methyl salicylate which is the major ingredient of aspirin. Native Americans historically used wintergreen to ease joint and muscle pain. Although it is not as well-known as some essential oils, it is no less effective. Studies have demonstrated that wintergreen essential oil has powerful cortisone-like effects which offer immediate pain relief. Wintergreen oil also has anti-spasmodic and anti-inflammatory properties making it an effective natural treatment for muscle spasms, cramps, muscular pains, and headaches. Like thyme oil, wintergreen is very strong and special care should be taken to dilute it thoroughly before use. Wintergreen is also considered unsafe for children as well as pregnant or nursing mothers due to its high methyl salicylate content. Eucalyptus essential oil derived from the Australian eucalyptus tree has antispasmodic and anti-inflammatory properties which make it the ideal tonic for muscular cramps, spasms, and pain. Eucalyptus has analgesic qualities and is recommended for those suffering from rheumatism, fibrosis and nerve pain as well as muscle injuries. Fennel essential oil can also help relieve your muscle spasms; it has antispasmodic properties and has been traditionally used to relax nerves, muscles and respiratory spasms. Fennel Oil can also be used to relieve pain from rheumatism and migraines and studies have demonstrated that it can provide relief from menstrual cramps and pain. Peppermint essential oil is often associated with respiratory complaints and relief from nausea but it also has excellent antispasmodic and anti-inflammatory properties and the ability to kill the pain. Peppermint is an excellent choice of essential oil to massage into your aching and cramped muscles after a strenuous workout; it provides wonderful relief from pain, cramp, and various spasms. Among its many therapeutic abilities, ginger essential oil boasts antispasmodic properties making it one of the perfect remedies for muscular spasms and cramps. Roman chamomile essential oil’s antispasmodic ability stems from its high content of ester. It is considered to be one of the most powerful antispasmodic oils and is often used to great effect in treating muscle spasms, cramps and pain as well as healing colic. Clary sage essential oil is a popular and very effective treatment for spasms and other related conditions like muscle and respiratory cramps and headaches. It can help relax the nerves and prevent the onset of involuntary spasms. Juniper essential oil does not get the attention that some of the others receive but is another excellent oil with analgesic and potent anti-rheumatic properties. This oil can help soothe your muscles, help them to relax and ease any pain. Try adding ten drops of your juniper oil to your bath and letting it wash over you. Alternatively, massage it into your muscles after diluting it with a suitable carrier oil like jojoba, coconut or olive oil. Juniper oil is extremely powerful and should always be diluted before applying it to your skin. Pregnant women and very young children should not use this oil. Turmeric is best-known as a popular spice that can add great flavor and color to your meals but it also contains active ingredients with excellent medicinal properties. Curcumin – the main active ingredient in turmeric has been studied extensively and has powerful anti-inflammatory, antioxidant and antiviral properties. Turmeric essential oil is becoming more popular in its own right. When massaged into the body it can have a wonderful, soothing effect on the muscles and joints and makes for a great choice for dealing with cramps and spasms. Try combining a few drops of turmeric essential oil with a carrier oil like jojoba or coconut oil and massaging it into your muscles whenever you feel the need. It can help treat cramps or spasms but can also relax your muscles and help relieve general aches and pains. Last, but definitely not least, frankincense essential oil is a very popular treatment for a variety of ailments. It has excellent anti-inflammatory and analgesic properties that can help treat cramps and soothe muscle and joint pains. Although frankincense is one of the more gentle acting essential oils, you should still mix it with a suitable carrier oil before massaging it into your skin. Alternatively, add ten drops or so to your bath, hop in and let the healing goodness work into your body. Korean researchers tested a mixture of the following essential oils: Lavender, marjoram, eucalyptus, rosemary, and peppermint (2:1:2:1:1 ratio). Your chosen essential oils can be used to treat your muscle spasms in several different ways. It is important to remember that you must dilute the oils properly before applying them and to test the dilution on a discrete area of skin before applying them fully to your body. Certain essential oils like thyme and wintergreen are known to cause reaction more than some of the milder oils and should be avoided if you are pregnant or nursing. An essential oil massage is a wonderful way to get rid of your aches and pains and relieve any unwanted spasms and cramps. Dilute around 10 drops of your chosen essential oil or a combination of oils with an ounce of a suitable base oil like jojoba, sweet almond or coconut oil before use. Soaking in a therapeutic oil filled bath is a great way to relieve your spasms, cramps, and pains. Add around 10 drops of your chosen oils to a hot bathtub and let your muscles soak in the goodness for as long as you want. You can also make a cold or hot compress to relieve your spasms and cramps. Make a hot compress by dipping a towel in hot water, ringing out the excess and adding 8 to 10 drops of essential oil. To make a cold compress just soak a towel in cold water, ring it out and wrap it around an ice pack. Add around 8 to 10 drops of your chosen Essential Oil to the pack and apply it to the affected muscles.